European research funding is organized in multiannual framework programmes. Seven of these framework programmes have already been completed. Currently ongoing is the 8th Framework Program for Research and Innovation Horizon 2020 with a total volume of almost € 80 billion. Horizon 2020 has a duration of seven years (2014-2020). 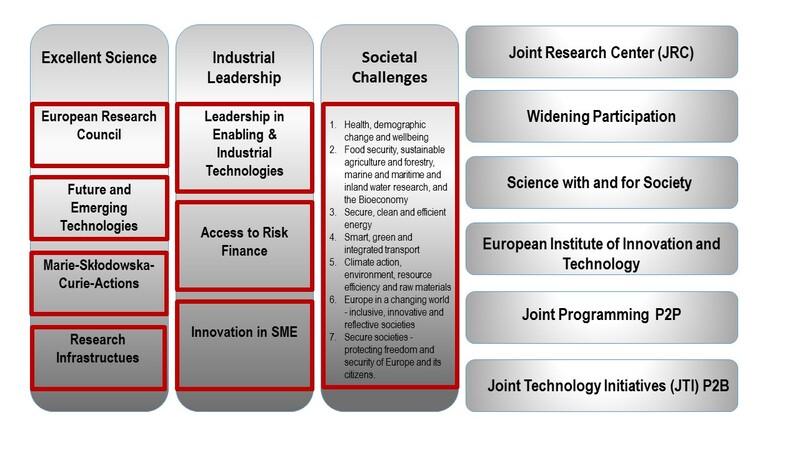 The programme is based on three pillars: Excellent Sciece, Industrial Leadership and Societal Challenges and has several smaller programme areas. Calls for proposals are published in work programmes and on the Participant Portal, information on ongoing projects on CORDIS. German National Contact Points (NCP). Erasmus+ offers a variety of possibilities for setting up for example international master programs, cooperation with third countries, researcher and staff mobility and especially strategic partnerships. Please contact the International Office for further information. COST (Cooperation in Science and Technology) enables researchers to set up their interdisciplinary research networks in Europe and beyond. It provides funds for organising conferences, meetings, training schools, short scientific exchanges or other networking activities in a wide range of scientific topics. Creative Europe is the European Framework Programme for support to the culture and audiovisual sectors. INTERREG is part of the EU's structural and investment policy. With INTERREG, the EU supports cross-border infrastructure, job market integration and cultural exchange (so-called Interreg A). Interreg also covers transnational cooperation in larger areas such as the Baltic Sea Region or the Alpine Space aiming at territorial integration of these areas (Interreg B). HERA (Humanities in the European Research Area) is a partnership between 24 Humanities Research Councils across Europe and the European Commission, with the objective of firmly establishing the humanities in the European Research Area and in the European Commission Framework Programmes. Innovative Medicines Initiative (IMI) is Europe's largest public-private initiative aiming to speed up the development of better and safer medicines for patients.